(57 reviews) Write a review! 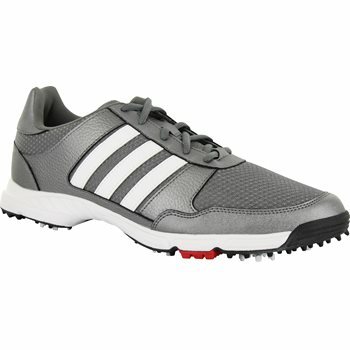 The Adidas Tech Response golf shoe combines running shoe styling with golf shoe performance and features an adiwear™ rubber outsole with an innovative 6-spike configuration. The Tech Response golf shoe also has ThinTech® low-profile EXP cleat technology which keeps the foot close to the ground for superior traction and stability. The soft cloudfoam EVA sockliner provides all-day comfort and support, while the lightweight mesh and microfiber leather upper delivers breathability and style. Bought these for my 12 yearold. They are good enough, looking back I probably wouldn't have gotten him a mesh golf shoe. Great when it's dry, but any moisture on the course and it's wet feet. For dry days and summer . Love Adidas. Great comfort without an exorbitant price.